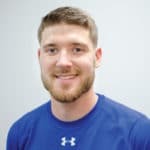 Alec is a NSCA Certified Strength and Conditioning Specialist and an AFAA Group Exercise Instructor. He attended the University of Wisconsin – La Crosse and graduated with a Bachelor’s degree in Exercise Science, as well as a Bachelor’s degree in Psychology. He then went on to pursue a Master of Science degree in Kinesiology at the University of Wisconsin – Milwaukee. Alec has an extensive background in the field of exercise, including experience with Personal Training, group exercise, strength and conditioning, and corporate wellness. Most recently, he was part of the Wellness team at Walt Disney World, providing personalized programming and group exercise instruction to a wide variety of Cast Members. He has had experience working with multiple modes of exercises and programming, including building muscle, toning, enhancing athletic performance, and injury rehabilitation. Alec’s love for fitness and exercise grew out of an athletic childhood, with a love for sports such as volleyball, basketball and tennis. During his time at UW-La Crosse, he knew that he not only wanted to learn more about how exercise can help improve athletic performance, but how he could use that knowledge to help improve anybody’s quality of life. This transitioned into bettering his knowledge every day in order to provide everybody with the best results possible! Whatever your goal is, Alec is here to help you every step of the way!